Dynamic DNS (DDNS)? This is a system that enables you to have dynamic IP address points to fixed domain name, so you don’t have to worry about domain name issue when the IP is changed as the domain name will point to new IP always. If you have home network and connects to Internet by using DSL/Cable broadband connection with dynamic public IP, then you can make use of this DDNS to host web server, email server and other server by just using that dynamic public IP. Or if you have several web servers that tie to different public IP, then you can point the domain name to either one of the server IP and make system maintenance on other servers. - Get five (5) hostnames in 88 available domains for free. - Forward web requests or mark host offline for maintenance or downtime. - Configure MX records for flexible mail routing. - Update host using ddns update clients for a wide variety of platforms. - Modify DNS TTL values for fast propagation or reliable static IP caching. - Deliver your DNS records to 5 DNS servers in 5 tier-1 datacenters around the globe. First you need to create an account on this DDNS website, then proceed to this DDNS link and click Get Started button. After that key in your username and password to proceed. Ok..Once you reach the following DDNS page, you can proceed to create your DDNS record. 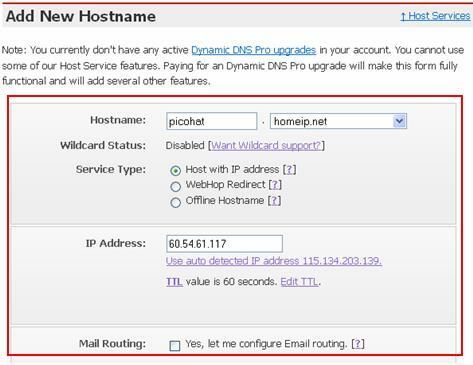 As an example, the hostname I choose is picohat and my dynamic DNS name is homeip.net. My Service Type is Host with IP address and I key in my DSL broadband IP (60.54.61.117) as IP Address. I don’t enable Mail Routing because I don’t have any mail server in my home network. What do you want to use this host for? Just select the services you plan to use. In this case I plan to use it for my mail and web servers. Click Add To Cart and proceed to activate it. Don't worry, you don't have to pay, as I know first 5 dynamic domain names you created are free. Note: You can always click that ? 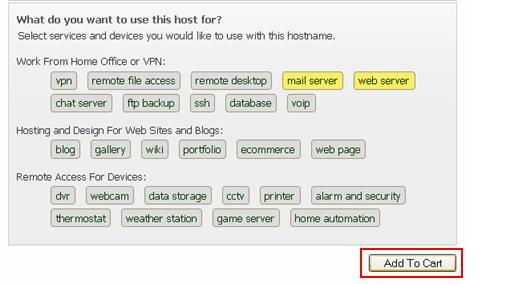 symbol in order to learn more on the DDNS settings, such as what is WebHop Redirect, Offline Hostname, etc. After that open the command prompt (cmd.exe), and try to resolve and ping the new domain name. 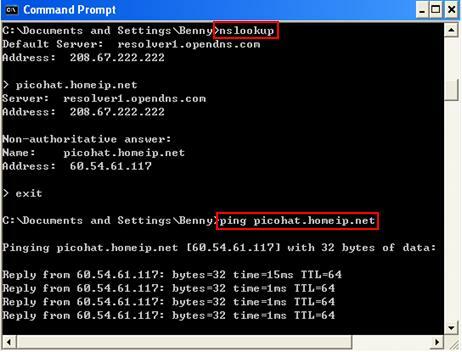 For my case, I able to resolve the picohat.homeip.net to 60.54.61.117 and also can ping picohat.homeip.net. So it’s working!!! Ok.. Continue to read this article on learning how to notify the Dynamic DNS server when there is IP address change.